A lot of Cherokees are concerned about our Principal Chief's recent attendance at the Democratic National Convention as a delegate. Some are also concerned about Baker's obvious loyalty to the Democratic party. They feel it is greater than his loyalty to the Cherokee people. This became obvious to many of us when our chief abused his role as our chief to denounce Scott Brown, the Republican candidate for the US Senate out of Massachusetts, for tomahawk chops and war whoops, while completely ignoring the fact Elizabeth Warren, the Democrat running against Brown, has been falsely claiming to be Cherokee for months. Besides his blind loyalty to the Democratic party, I wondered if there might be something else that would lead Baker to refuse to call Warren out on her false claims. I wondered if there was something in his upbringing that would lead him to be soft, very soft, on fakes and the stories they tell. When I compared his genealogy to Warren's several months ago, I noticed that one story he tells is not true, but I thought there might be more, so I continued to dig. It didn't take long to see why Baker might feel sympathy for fakes and wannabes.This post is the first in a series that will show Baker's ancestry and why I believe he would throw real Cherokees under the bus by refusing to acknowledge the truth about our history. Baker is Cherokee. There is no doubt about that. He has the ancestry and he is recognized as a registered member of our nation, so he IS Cherokee. That is not the issue we are exploring. The topic we are exploring in this series is the fact that there is a lot of things in his family history that could have been passed down and led him to form the opinions he now has. 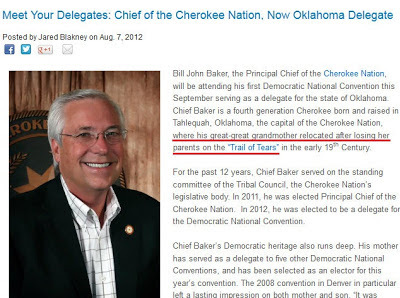 By showing many of the things Baker probably heard his entire life are not true, I think we can show he has some misconceptions about Cherokee history and genealogy and therefore, he is giving Warren a pass when he should not be doing so. Anyone who knows anything about Cherokee history knows there were two main groups residing in Cherokee Nation after the removal - the Old Settlers and the Emigrants. The Emigrants were those who traveled the Trail of Tears. The Old Settlers had removed many years earlier by their own choice and were not forcibly removed. Knowing this fact shows one story Baker tells about his ancestry cannot be true. "Bill John is the great-grandson of Nancy Walker Osage, an early Tahlequah Business Woman and Cherokee Healer. Nancy's mother, Sarah Tackett was brought to Tahlequah Indian Territory by friends after her parents died on the "Trail of Tears". As we can see in "Meet Your Delegates", he is still using the story. "Chief Baker is a fourth generation Cherokee born and raised in Tahlequah, Oklahoma, the capital of the Cherokee Nation, where his great-great grandmother relocated after losing her parents on the “Trail of Tears” in the early 19th Century." The problem? As shown in my previous research, Sarah Harlin/Harlan Walker Tackett came from an Old Settler family. Her family was in Indian Territory long before the Trail of Tears. And her parents were still alive in 1851. 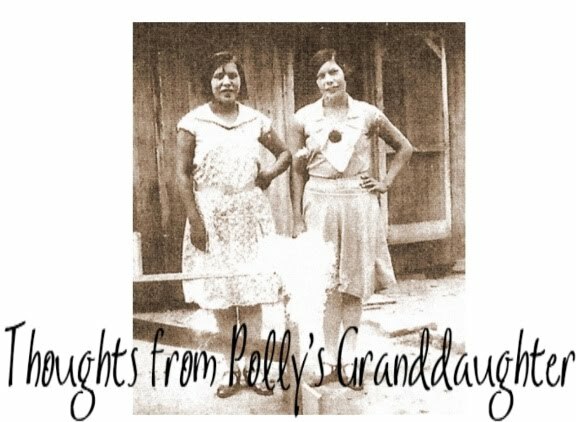 "Sarah Harlin, the great great grandmother of Chief Baker, was the daughter of Eli Harlin and Delilah Alberty. She was born about 1824. In 1851, she was listed on the Cherokee Old Settler Roll, Flint 23. In 1880, she was listed on the Authenticated roll of the Cherokee Nation under the name of Sarah Tacket, page 329, number 2707, Native Cherokee. In 1896, she was found on the Cherokee Census roll under the name Sarah Tackett, page 1255, number 3400. In 1896, she was also found in the Cherokee Old Settler roll, page 460. In 1902-06, she was found on the Final Dawes Roll as Cherokee by Blood, 1/2, census card 6402, roll number 15325. 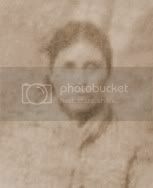 She was found on the 1910 US Census listed as Sarah Tocket, living in Crittenden, Cherokee County, Oklahoma with her son-in-law, her daughter, her grandchildren and her grand daughter-in-law; race listed as Indian." The story Baker tells, one that has probably been passed down in his family, isn't true. But he has believed it without researching to see if it is true. I believe that shows he made a mistake in judgement because this was an easy myth to stop. I believe it is one reason he is willing to accept family lore without proof from people like Elizabeth Warren. 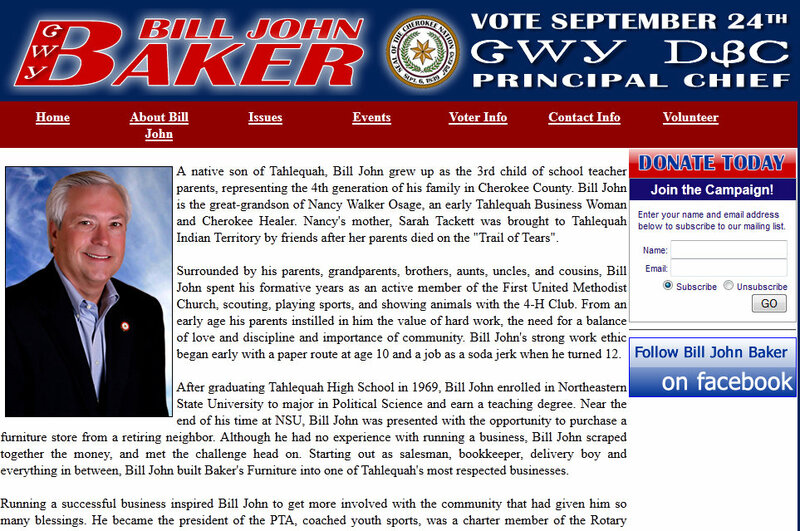 In truth, Baker did have an ancestor who died on the Trail of Tears, but it was not in the family of Sarah Tackett. Sarah's husband, Ebenezer B. Walker, the father of Baker's great grandmother, Nancy Walker Osage, did lose his mother, Nancy Bushyhead, on the trail. Ebenezer's father died before the removal, so it is likely other family members brought Ebenezer on after he was left an orphan on the trail. Does Baker telling the story wrong make him a bad person? No. But it does a disservice to his real ancestor who died on the trail by saying it was a different one. And it does a disservice to truth in Cherokee history by his repeating this story when it is not true. And it shows he believes family lore without investigating to see if the stories are factual. Because of his willingness to accept family lore as truth, I think it will soon become clear why he won't speak out against Warren. Stay tuned for the next in the series on Chief Baker's ancestry. There's more. A lot more. And it isn't pretty.